American composer Steve Reich, born 1936, was a decade older than the late French composer Gerard Grisey (1946-1998), but the work of both flowered in the mid to late 1960s, Reich as co-founder of Minimalism and Grisey of Spectralism. Although they worked in very different idioms, each radically expanded the sonic range of contemporary music and challenged it structurally. 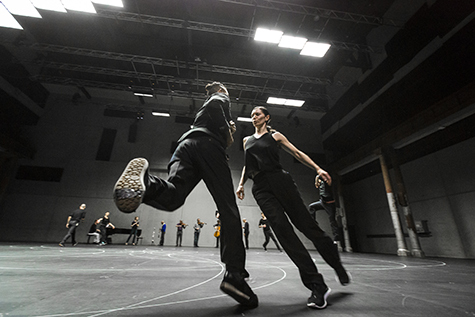 One of the most exciting ways to experience their music is to see it performed to by the great Belgian dancer and choreographer Anne Teresa De Keersmaeker and her company Rosas. Minimalist in conception, with its repetitions and cyclical movements, De Keersmaeker’s exquisitely patterned FASE (which premiered in Brussels in 1982) was inspired by Reich’s pioneering ‘phasing’ which had unleashed astonishing complexity from the apparently most simple of means. In Reich’s Piano Phase for two pianos (1967), danced to in the first part of FASE, a short phrase is repeated and then counterpointed with a new, rhythmically very close one played at a slightly different pace. This generates a new sound out of the synthesis, which in turn becomes a kind of unison open to the arrival of another complicating rhythm. In the ‘phase moment’ the dancers (De Keersmaeker and Tale Dolven) turn on the spot, dresses swirling, arms extending almost to finger touch until one goes with the new beat, putting the two ever so slightly out of synch, fingers unaligned until the second dancer catches up. It’s magical because you are uncertain when and how it happened. 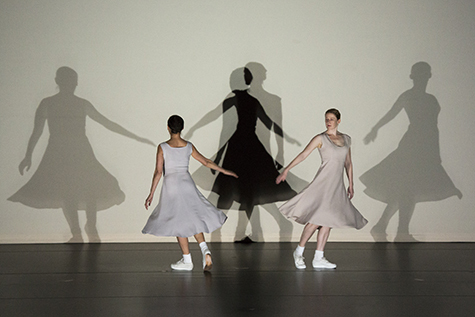 What’s more, the phasing is heightened first by the ‘twinning’ of the dancers—similarly attired in simple frocks, white socks and exercise shoes and hair tied back tight—and second by the angled lighting which produces a third shadow on the wall behind, a phasing, double shadow—a new dancer. Music and dance are perfectly partnered. The climactic phasing is framed by a walking pattern, left and right in a line, arms swinging out horizontally and forearms gently folding into torsos and then backs. This is transposed mid- and then downstage, in new lines of light and in tune with the music’s growing complexity and urgency. Fists form as arms are raised and forearms lock hard against the body, shoes skid and there are gasps of effort and release. Then the pair moves back to the second line, then the first where they and their shadows find sheer un-phased unison. Seeing minimalism danced—whether by Lucinda Childs to Phillip Glass’s Einstein on the Beach (Melbourne Festival, 1992) or Molissa Fenley and Dancers to Andrew Davis’s Hemispheres (Adelaide Festival, 1984)—is a very special pleasure, at its best in De Keersmaeker’s Piano Phase. The other parts of FASE are also wonderful. Come Out (1996) is one of the phased tape loops out of which sprang Reich’s brand of Minimalism. As in Piano, the dancers’ centre of gravity remains at the same height throughout. Here, in shirts and trousers, they are seated on stools in a rectangle of light beneath two orange lampshades. They gradually if quite sharply rotate 360 degrees, more palpably in and out of synch this time with an array of identical gestures—arm raised up from waist level, hand behind head, head turning sharply back and an almost lunge that suggests a potential gravitational shift. The music of Come Out —the transformation of a fragment of speech into an astonishingly layered, reverberant and rhythmically complex soundscape—provides the work’s momentum but also an eerie context. De Keersmaeker performs to Violin Phase (1967) alone, working to the points of a circle and its centre. In a dress again, arms swinging, she walks circling in one direction and eventually the other. As the music re-shapes itself, she introduces a near skip to her tread, moves to the centre, skirt swirling, arms raised high and completes and repeats an unusual calculatedly awkward turn, a knee raised, leg kicking out, body momentarily angling down, but the centre of gravity constant as ever. However at points of the circle she bends, touches the floor, as if playing a game, spins furiously, flicking up her dress, baring her underwear and moving with the joy and ease of a young woman (there’s a fine version shot in a park). The final part of FASE has De Keersmaeker and Dolven, once again in shirts and trousers, dancing in profile to the rapid phasing of Reich’s Clapping Music (1972). Leisurely stances, soft shoulder lifting and casual single arm swings wonderfully suggest abstracted tap dancing. After FASE I head home to listen to Steve Reich anew, the excitement of many years ago reignited and FASE, an undoubted 20th century classic, vividly inscribed in my memory. In 2012, thanks to Carriageworks, we witnessed two large-scale works by De Keersmaeker, Cesena and En Atendant (read the RealTime review), demanding but deeply rewarding performances that evoked a sense of continuity between the Middle Ages and now and which were imbued with a sense of community and especially ritual—focused in Cesena on the Sun—in which the circle is all defining. De Keersmaeker returns to the circle in Vortex Temporum with its many overlapping circles inscribed on the floor (just as one had been for Violin Phase). More accessible than its two predecessors, if more musically demanding (strange notes, harmonics, overtones), this 2013 work made sense of the music in the matching of individual or grouped dancers with particular musical instruments or clusters. Watching the dance was at times like reading a score. The pianist would pounce (yes) on the keys and the ‘piano’ dancer would, with his idiosyncratically squared-off bouncing movements, jerk in response and go off on his own trajectory. Primacy is initially given to Grisey’s music, to the instrumental ensemble, Belgium’s Ictus, who performed the opening movement of Vortex Temporum minus scores, minus conductor, minus dancers, the pianist’s aggressive playing (‘out of which’ might flow delicate string and wind flutterings) providing the initial sense of heightened, raw theatricality that is to ensue. The musicians exit, replaced by dancers standing in their stead, heads down, sinking into a half turn, leaning back and then breaking into units of individual and collective expression before uniting with the now standing, and playing, musicians. All glide like planets around the huge stage, the grand piano ‘joining in,’ pushed, while being played, by the conductor—who has just appeared—in wide circles until positioning it upstage where the musicians gather, an ensemble once again on the edge of a turning cosmos with its discordant music of the spheres. Often, as in Cesena, the dancers move backwards, only sometimes glancing behind but relying mostly on heightened proprioception and a predetermined trajectory. This suggests not only a kind of freedom but also that the performers belong to a more determined order. However, amid the repeated circlings as the work moves towards its conclusion, individual dancers break into their own patterns and cross lines. For example, one dancer develops a limping run, falls and spins, strikes a shoulder stand and falls back to a viola glide (the score is rich in evocative glissandi). There are mass movements, a frolic with everyone running and then a strange gathering at the end, dancers in a small cluster, heads down, some bodies bending and reaching as if, having at last paused, they’ve found something elemental in the earth beneath their orbiting. However intangible the ending, the work’s overall sense of unanimity amid incredible diversity and potential chaos is very powerful. In Vortex Temporum, as in other recent De Keersmaeker creations, there’s ample casual movement—walking in and out of the dance— alongside formal expression. This perfectly suits the dramatic unpredictability of Gerard Grisey’s score with its bursts of energy, just as the individual performances and circlings align with its tonal complexities. Although FASE was created at the beginning of De Keersmaeker’s career and Vortex Temporum very recently, they reveal great kinship, not only with each other but with all of this remarkable choreographer’s creations. The works are rooted in walking—which becomes magical. As De Keersmaeker has asserted (RealTime 111), “our walking is our dancing. With walking we organise space and time. Walking is the basic architecture of movement.” And her works pay homage to composers with superb bodily and spatial realisations of their scores. Festival director Lieven Bertels honoured De Keersmaeker, Steve Reich, Gerard Grisey and audiences with these superb Sydney Festival pairings.